It was a busy day for the Duchess who joined inner city children in Wrotham, Kent this morning for a camping trip, See today's earlier post for info and photos. 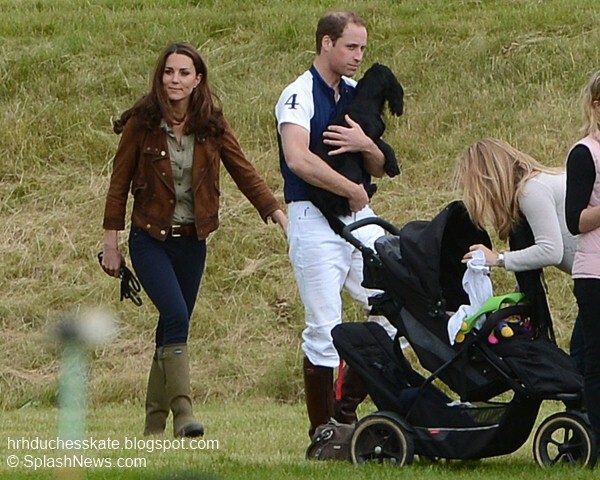 Afterwards Kate travelled to Tetbury where William and Harry played a charity polo match at The Beaufort Polo Club. Kate brought her adorable cocker spainel, Lupo along. Below we see Kate with Autumn and Savannah Philips. 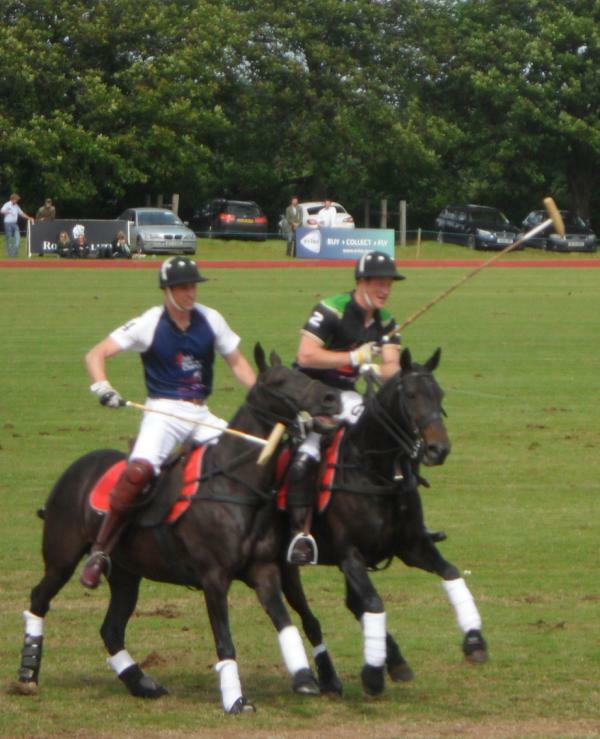 The Princes competed against each other in opposing teams with Harry's team, Zedan Polo, achieving a narrow victory. The Beaufort Polo Club was formed during the winter of 1928-1929 and has become known as one of the friendliest clubs in England. It is home to the famous Tomlinson polo dynasty and plays host to the first Audi England International match of the summer. 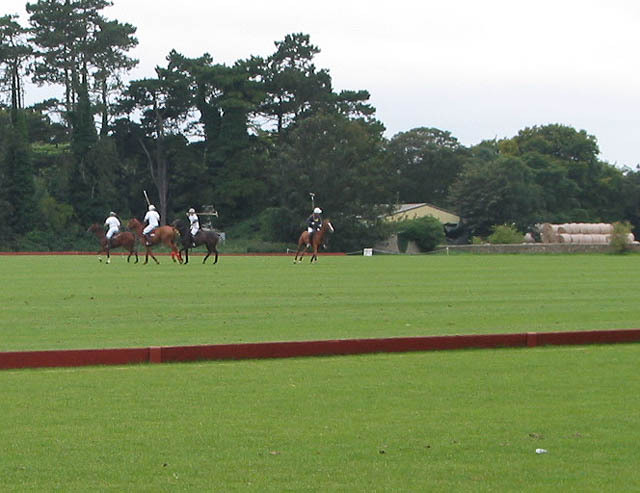 The Princes have played polo their regularly over the past number of years. If any of you are polo enthusiasts, the cub has on online shop where you can purchase items such as the Beaufort Bear, Baseball cap and clothing items. The always informative Trisha noted Kate attended a polo match on the June 17 2006, exactly six years ago today. Below we see Kate and Pippa wearing pretty summer dresses. It was lovely see Kate attending one of William's matches today. 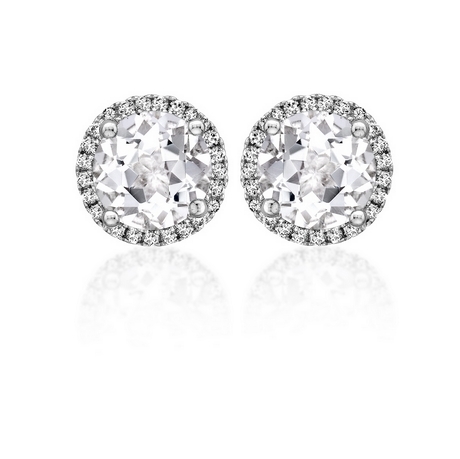 During their pre engagement years she attended as many as possible. 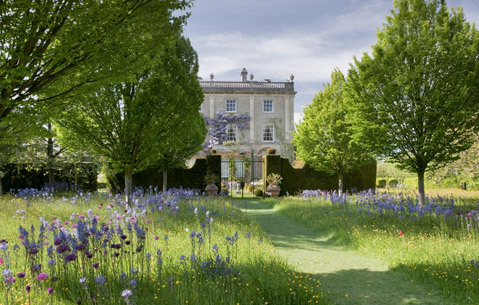 The couple spent the weekend in Highgrove house in Gloucestershire, a residence of Prince Charles and Camilla. Prince Charles hosts many briefings and receptions at Highgrove. It is the ideal residence for Prince Charles, stunning scenic views and beautiful gardens yet within close proximity to London. Perhaps the royals will have a Fathers Day dinner there later? Kate wore the same outfit as this morning except for the brown, distressed suede jacket. I do not currently know the designer but will update when it is confirmed. 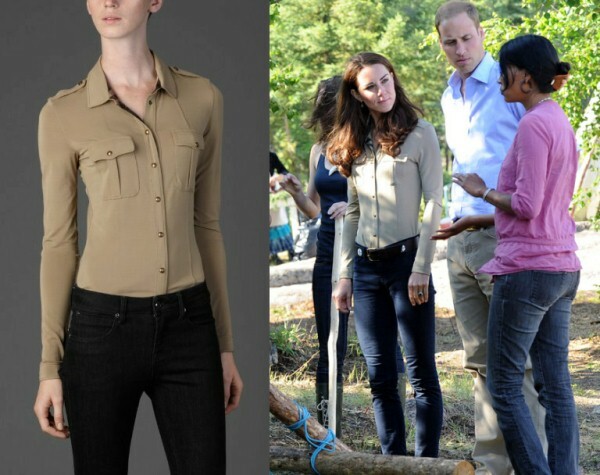 Kate first wore the £295 Burberry military pocket shirt on July 5 2011 during a visit to Blachford Lake. 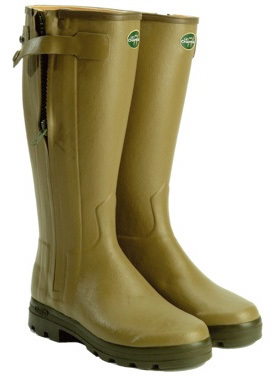 Again Kate wore her favourite Le Chameau Vierzonord wellies. See you all tomorrow afternoon for Order of the Garter. Wishing all of you Dad's a very Happy Father's Day :) We'll finish today's post with one of my favourite photos of the day taken by the wonderful James Whatling. Thank you so much for the pictures! I very enjoy so many news about Duchess Catherine. I love that red poka dot dress on her. I hope she still has it,and one day we get to see it on her again. Do you know who it's from? thanks for this great post again! You can also see a little sign at the back of her jeans. I think JBrand don't have such sign at the back of their jeans? Love how Lupo is included. He is such a curie. Where is her jacket from does anyone know? I can tell that our Kate definitely put on some weight, which is nice. :) She looks so healthy and radiant comparing to last year right before the wedding. I agree with you that the beautiful Duchess has put on a few pounds. She is really looking good. You can see it in her face. Take a look at her in the picture in the red dress with Pippa and now. She is glowing now. And you can also tell by the shirt she is wearing. If you look at one of the pictures during their Canada trip, the shirt made her look really slim and now she fill's out the shirt really nice. However the waist of the pants is dangerously low...considering she will be photographed...I think she carefully tucked in the shirt and made sure it won't slip off and show ...you know what. But it's still such a low rise jeans...Personally I just hate low rise pants. I love to see them so relaxed and with the dog! Thank you for the lovely comments, As The Way We Were said Kate is looking much healthier and so happy. Seeing her with little Savannah was just precious. Oh Charlotte that would be great. It would be great to see all the other times the beautiful Duchess was out supporting her Prince during his polo matches. 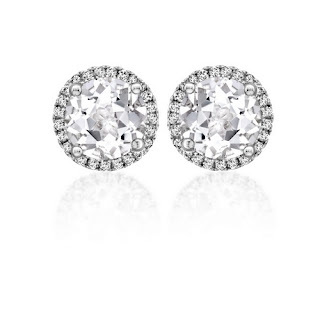 Also can you re do the Kate loves William. I have looked all thru your "Kate Loves" and it is not there. I think it got lost when the blog was down. It would be nice to have it when William turns 30. 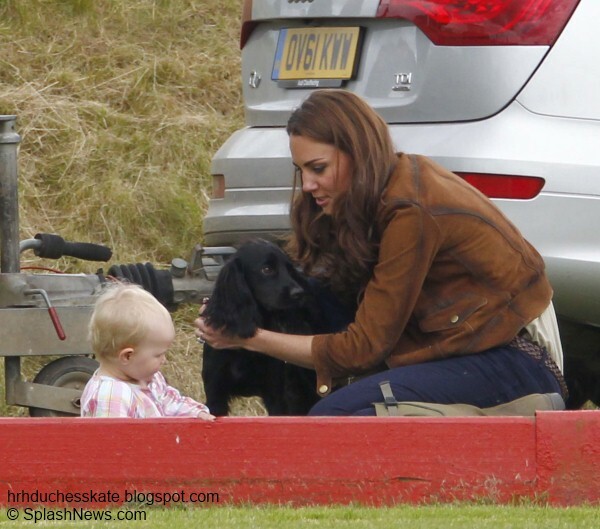 And I agree that the Duchess is looking at healthier now. In the past she looked fit but a little thin but now she is looking good. 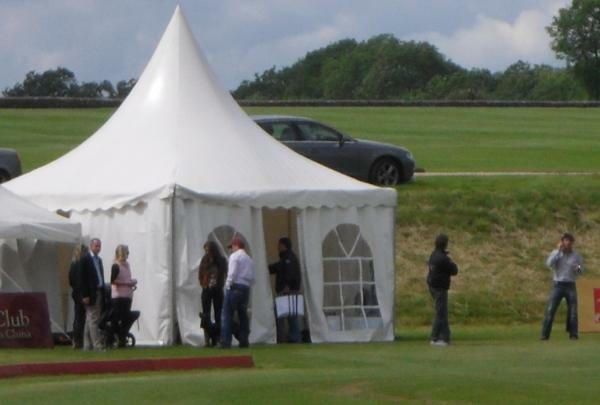 Also have you seen the pictures on www.rexfeatures.com of the royal family today at the polo match? If so did you see the picture of William & Kate with a girl in a blue dress, if so do you know who that is? It kinda look's like Pippa but not sure. Now I can't wait until tomorrow and your blog. Oh and just love the last picture. Just look at poor Lupo, he is standing behind his parents looking sad. He is saying nobody is paying attention to me daddy...lol Wish the picture was shot from the front so we could have seen their faces. But just love seeing William holding tight to his Duchess. And his Duchess with her handjust above on his bum, just priceless. Thank you so much Pauline. We have Order of the Garter tomorrow then I will definitely write up a Kate loves Polo within a couple of days. She has been to so many it seems a nice time to look back. I will have a look for the romantic moments and if I cannot find it, I will write one up! First of all, let me say that I think anyone who truly loves the animals has a wealth of character. I found the attitude of William with Lupo so cute. I have a dog and I love her so much, but looking at the set of all events (Jubilee, play polo, etc.) between William and Kate, in June, I must confess that I thought William gave little attention to Kate. It's just an opinion, I have no intention of generating some speculation. Kisses! Ana Laura- I had to laugh at your comment (a good laugh) about the speculation on William & his Duchess. As we know people do that with out seeing the whole picture. I went back and looked at all the pictures on different sites and William did pay alot of attention to his Duchess. But unless people take the time and do that, they will start to speculate about their relationship. At first I did start to wonder but then insead took the time. And did you see the picture of them in the Star where William was holding the javelin (during their trip to Nottingham with the Queen) and his Duchess had her hand on his and had this look on her face like it could be just like you (in a naughty way if you know what I mean. It was so cute. There are so many great pictures out there showing how much in love they are. That Burberry military pocket shirt will make my wife go crazy. It would give her a more sporty look which I like by the way. Thank you for your work!! Love your blog, darling!! Lovely post as always. thank you so much! Oh and btw Prince Charles has become Princess Charles all of the sudden when you're talking about him transforming the gardens. 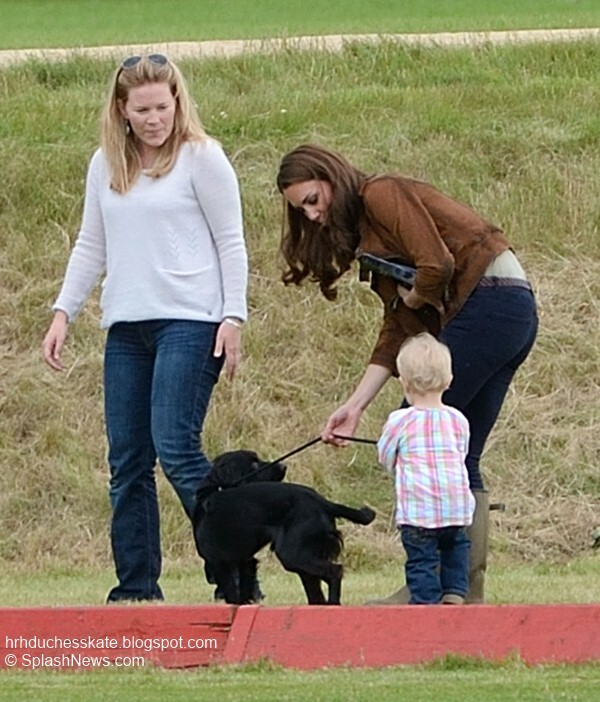 Hi Charlotte, I read recently that Kate may be attending ascot do you know if this is the case? Oh and Charlotte maybe you can find a picture that I saw today on E News. You know the last picture you posted with the Prince & his Duchess with the two other people with their arms around each other. Well there is one out there that was take with just William & his Duchess with their arms around each other and the Duchess has her hand on William's bum. It is just priceless. Can you see if you can find that one and post it. The fans here would have a good laugh. It is so sweet. Hope you can find it. Hi Pauline, I'm not sure which photo you mean but have you looked at the Daily Mail, Getty etc? Charlotte, The picture I am talking about is one where the Ducehss and Prince are standing together with their arms aroudn each ohter and the Duchess has her hand on his bum. It was taken by the same guy how took the last photo you posted above. Maybe you can get in touch with who took that picture and see if he/she has it. It would be something to post here, just show's how normal they are. Just a girl and her guy sharing a loving moment. Hope you can find it. I saw it again on E News today. Nay more news on the Duchess and her Prince attending Ascot? Hi Charlotte, could I use one photograph of this blog? I want to make a new look: the picture of kate and cheap chlothes in case you want to copy her look. Of course I will refer to your blog! Hello Elizabeth, I licence the images from Splash News so I'm afraid I don't own them. Terribly sorry for any inconvenience.